Ad extensions are a way to give potential customers useful and relevant info beyond a regular text ad. You can win a customer’s consideration, convince her of your value, or drive her right to a conversion. Ask yourself which extensions would fit with your keywords and fulfill a potential user’s needs. People engage with ads that have extensions. Seller ratings give users confidence in your website. Call extensions connect customers right to your employees. Advertisers spend lots of time optimizing their ad text (which is great), but you should know that implementing extensions is typically a more impactful way to improve CTR. An ad extension adds value to potential customers just by being present. Additionally, with the recent changes to ad rank, extensions have become an increasingly important part of getting your ads noticed. Every type of extension that we offer is intended to benefit our users, which translates to a higher CTR for you. Many, such as sitelinks, show improvements of 10-20%. There are tangible and measurable gains to giving users more information, and extensions are auto-optimized to show the best possible combination on each and every auction. Sometimes the “best possible combination” translates to areas aside from CTR - users may get value from seeing a phone number on a desktop ad (i.e. a direct connection to your business via a phone number) even if that doesn’t translate to a routine click. We’ve also found that more information is a good thing, which means that ads with multiple extensions perform better than ads with only one extension. Identify which extensions work for your business and implement them. The best combination of these extensions is automatically determined on an auction-by-auction basis. Enabling extensions is a good thing, but remember that your extensions are most likely not going to show 100% of the time. Only certain positions are eligible to show certain extensions. 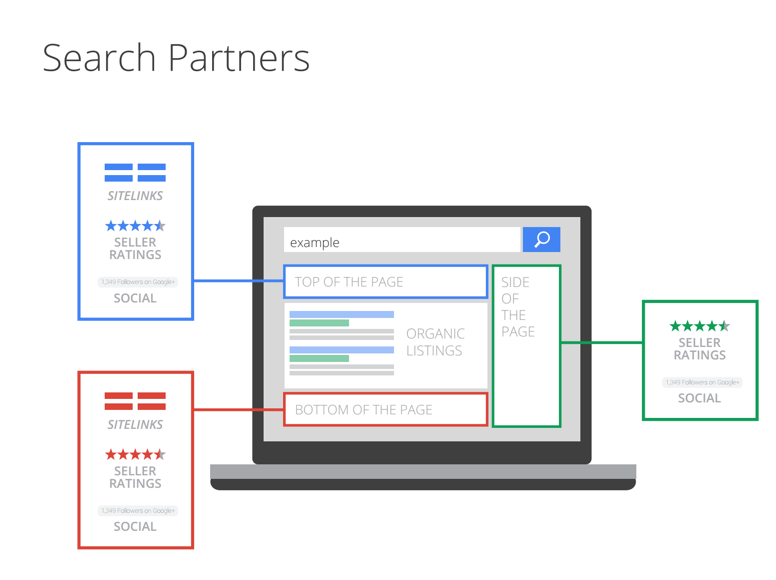 Note: Search Partner site owners choose what, if any, formats they allow, so not everything will show by default. As you can see, placement on the results page determines which of your extensions can be shown. If you know you have great extensions in place for users, watch your average position and placement to ensure that your extensions are showing as often as possible. We try to show as many relevant formats as possible in the available space. Since there are so many moving pieces, there’s no way to prioritize which extensions you want to show. 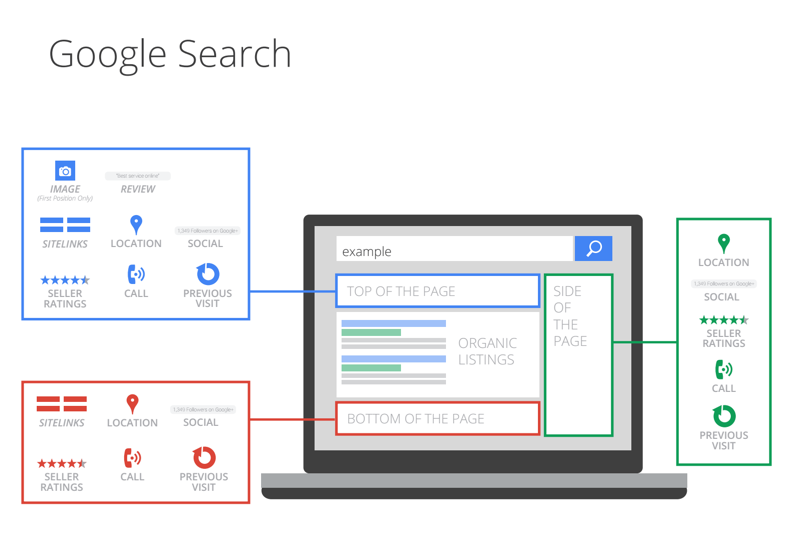 Enable whatever makes sense for your customers and let the AdWords system decide within those options. The specific extensions that are displayed are a function of your previous performance, user context and available space on the page. In many cases there isn’t a lot to optimize for extensions. Implementation is the only step to take for a practitioner, but that doesn’t mean you can enable them and never think of them again. Be aware of what’s going on in your account so that you know you’re saying the things your customers want to hear. Report on how your extensions are doing by taking a quick snapshot of before and after implementation. Take note of when you turned on certain extensions and compare dates in the interface to ensure you’re heading the right direction. This isn’t going to be a perfect solution, as there are lots of other variables present over that same timeframe, but it should give you directional evidence regarding your account’s performance. Segment your reports by click type to see detailed performance for many of your extensions. Anything that’s active in that time period will appear as its own type of click. There isn’t any reporting on the extensions that appear automatically (seller ratings, social annotations, previous visit annotations). Extensions are a proven way to provide value to users and increase your ad’s CTR. Implementing every type of extension that makes sense for you should benefit both your users and your account. Stay tuned for Part II of the Field Guide. We’ll cover details about the available extensions and things that practitioners should keep in mind when implementing them.